In summer, many people are more active with their dogs and with this increased activity, there is also an increase in the possibility an emergency situation. Learning how to give emergency CPR to a dog, treat heat stroke, sunburn and adminster first aid in many emergency situations could potentially save your dog’s life. If you dog cannot breath, if he has been injured or drowned and is not breathing, emergency CPR either mouth to mouth or with crest compression could mean the difference between life and death until you get him to a veterinarian. Cardiopulmonary resuscitation (CPR) is the simulation of vital functions. You do for your dog what he cannot do for himself – breathe and pump blood. You must compress the heart and lungs to make them perform their vital function. Signs: Dog not breathing, gums purple, dog out. Prevention: Accident avoidance. Vigilant attention to your pet and his surroundings. Treatments: Immediate care is necessary to save the dog’s life. Begin chest presses (CPR-1) every five seconds for one to two minutes. If gums do not turn pink, attempt mouth-to-nose (CPR-2) for one to two minutes. If there is still no response, perform massage in addition to mouth-to-nose breathing (CPR-3). Push in on the chest at five-second intervals to assist breathing (contraindicated with penetrating chest wounds, broken ribs, and any other significant chest trauma). Note: One quick chest press can clear an obstructed airway and should be done before attempting mouth-to-nose respiration. Place your dog on his side and stimulate his inner nostrils with a cotton swab or a stem of clean, smooth grass. This may initiate a sneeze followed by breathing. If not, gently grasp and pull out his tongue, checking his mouth for foreign bodies and color. Begin chest presses to compress the lungs and stimulate reflexive breathing. Slowly depress the chest for one second, release, and allow three or four seconds for the chest to expand and inhale air. Repeat presses every five seconds for one to two minutes. Stop occasionally to observe if breathing has spontaneously resumed. Monitor the color of the gums and tongue. A return to pink is a sign of recovery. Feel for the heartbeat in the lower anterior chest between the dog’s elbows. If present and the gums remain pink, continue chest presses until dog regains consciousness or breathes on his own. If there is no response in two to three minutes, administer mouth-to-nose resuscitation (CPR-2). To perform chest presses, place your dog on his side and use your open hand to “breathe” the chest. Press air out and then allow air to reflexively flow back in. Repeat. Firmly grasp your dog’s tongue and pull it out. (You can use a clean rag for traction if one is handy.) Look and explore for anything that may be lodged in the throat or mouth, obstructive or otherwise. Attempt to remove anything that might be present. With a brisk chest press (CPR-1), clear the airways. If (a) nothing is expelled and the gums remain purple, (b) no heartbeat is felt, or (c) the dog is still unconscious, begin mouth-to-nose resuscitation. Clasp your dog’s mouth with your hand and cover his nostrils with your lips. Blow in for one second, gently at first; release; after a second, push lightly on chest to assist exhalation. Repeat until gums become pink and the dog begins breathing on his own. Feel for a heartbeat; if heartbeat is present, continue until the dog is able to breath on his own and his gums become pink. If there is no heartbeat, begin heart massage (CPR-3). 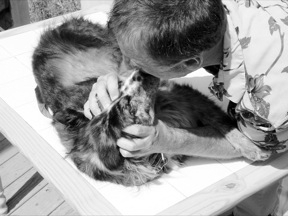 Mouth-to-nose resuscitation will be necessary if chest presses do not revive your dog. When there is still no heartbeat and no pink gums in response to mouth-to-nose breathing, start heart massage and continue mouth-to-nose resuscitation. Squeeze the heart with your fingers placed between the dog’s elbows. Use firm, repetitive one-second bursts to pump blood. Use chest presses to assist exhalation of the air you have blown in. If you are alone, alternate mouth-to-nose with heart pushes, with the pattern of one force breath, five heart pumps. Repeat for ten minutes or until breathing and heartbeat are restored. If the dog’s heart has stopped, place your hand around his chest between his elbows, and massage the heart to pump blood through his body. Causes: Fishermen and fisherwomen who are careless about their casting techniques, improper storage of hooks. Signs: Hook embedded in the skin or mouth. Prevention: Do not leave hooks about, especially hooks baited with liver for catfish. Treatment: Have an assistant restrain the dog with a half nelson stretch. Hook removal hurts the dog, so be sure he is properly restrained before starting. Wash your hands and disinfect the area. If the hook enters and exits the skin and the barbed portion is visible beyond the exit area, clip the barbed portion off with wire cutters and roll the hook out from its entry wound. If the barbed portion is imbedded in flesh, tie or loop a strong line around the bend in the hook. Press down on the eye of the hook, and give the line one hard yank away from the entry site. Alternatively, hemostats can be used to grasp and remove the hook, but this can be a slower, more painful process. If several attempts are unsuccessful or the dog resorts to biting you, abandon the attempt and head to the vet. Encirclage is the wrapping of line or wire around a limb, or occasionally the neck, of a dog. Sometimes line wrapped around limbs is hidden in the hair or becomes imbedded in the flesh before anything is noticed. Limping and swelling becomes apparent when the line tightens. Exercise can worsen the condition and cause theline to become further imbedded. Causes: Fishline or wire that wraps around limb or neck. Collars that shrink or become too small for growing dogs can create neck sores. Signs: Limping. Swelling of affected limb. A bad smell is sometimes the first sign of encirclage. Prevention: Do not leave hooks or line unattended or baited. Treatment: Restrain your dog and attempt to lift the wrapped line away from the body with tweezers, hemostats, scissors or a barbless dulled fish hook. Clip or untie the line and remove it. Clipping the hair, cleaning the area, and soaking may facilitate locating and cutting the string. After the line is removed, flush and soak the area. Rest the dog. If swelling persists or the dog has no feeling below the encirclage, seek veterinary treatment. Caution: Do not pull on a swallowed fish-hook line or cut all of the line away. If the hook and/or line are swallowed, it is very unlikely you will be able to successfully or safely remove it. Prevent your dog from eating anything and seek veterinary care. 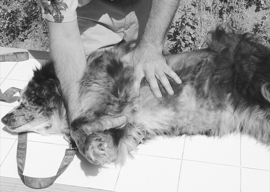 Fish hook removal – dog gently but firmly restrained. 1. 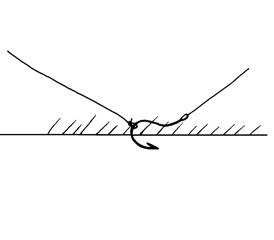 Apply line to curve in hook. 2. Keep gentle tension on original line to stabilize the hook. 3. Pull applied line with a quick jerk to dislodge imbedded hook. Causes: Overexertion in hot weather for obese, aged, inexperienced, metabolically diseased, or under-conditioned dogs. Signs: Weakness, refusal to continue exercise, inability to move, frantic panting, bright red tongue, muscular weakness, collapse. Severe signs include paralysis, bloody diarrhea, unremittent panting, and glassy eyes. Prevention: Allow for plenty of rest and fluids in hot going. Gradually condition and accustom your dog to arid conditions. Treatment: Reduce your dog’s temperature by bathing him in cool water and evaporating the water with cool air. Provide shade. Monitor the dog’s temperature and other vital signs. If the vital signs deteriorate, it may be necessary to submerge him in cool water to reduce his core body temperature. Take care to not let any water near his head. Offer electrolyte water to restore proper muscle and nervous function. Seek veterinary assistance if your dog’s condition does not improve. Causes: Overexposure to sunlight in sensitive, white-nosed dogs. Signs: Redness and swelling of unpigmented skin along the top of the nose. Prevention: Apply sunscreen to unpigmented areas before setting out. Repeat as needed. Avoid excessive exposure to sunlight for sensitive dogs. Wind and snow-reflected sunlight aggravate the condition. Treatment: Minimize or prevent any further direct sunlight. Apply cold water compresses. Apply Thermazine salve to affected skin in severe cases. This entry was posted in dog health and tagged CPR for dogs, emergency first aid for dogs, emergency heart massage for dogs, first aid for dogs, heat stroke in dogs, Mouth-to-nose resuscitation with dogs, removal of a fish hook from a dog, sunburns on a dog. Bookmark the permalink.